Skcin launched the UK’s first ever national educational ‘Accreditation' programme many years ago now and we continue to lead the way with the subsequent development of a suite of Accreditation programmes that cover key ’at risk’ and influential target sectors with the key objective of preventing skin cancer and promoting early detection to save lives. Most importantly, all our accreditation programmes are annual, requiring participants to review, refresh and reinforce year on year. OUR SUN SAFE SCHOOLS NATIONAL ACCREDITATION PROGRAMME IS NOW TEACHING & REACHING OVER 620,000 CHILDREN AND THEIR FAMILIES NATIONWIDE…. Teaching children from a young age the importance of sun safety to influence behaviour for a positive, sun safe, skin cancer free future is a no-brainer. Every child in the UK goes to school and ALL schools have a duty of care to safeguard these children whilst being best placed to educate them. It’s also the perfect way to reach the parents and families of every child, engaging the wider school community in vital sun safe messaging. There is a much bigger picture here though! As government calls for ‘blue-sky’ thinking when it comes to preventing skin cancer - what we offer is a strategic and robust solution and has been proposed to Government in many times via lobbying in the past with Melanoma Taskforce and ongoing work with the Department of Education and our submission to the Public Consultation on school’s curriculum content last year This tireless work goes on behind the scenes in addition to work supporting our service users. UV awareness and skin cancer have always been regarded as a public health issue and not an educational one. The fact is that they are inextricably linked is part of the challenge we face in addition to so many other priorities placed on Government. These things take much time to implement, but Skcin is in this for the long haul. We been offering our educational solutions for six years, Australia who take the lead in this field have taken this seriously and they are 20 years ahead, so this is marathon, not sprint. Aleph Bet Children's Center is now an Official Sun Safe Nursery! Skcin are pleased to announce that Dubai English Speaking School in Dubai have completed Step 3 towards becoming a Sun Safe School by conducting a whole school assembly to introduce the scheme and the importance of Sun Safety to the children. “Fabulous slides for the power point presentation. Thank you. 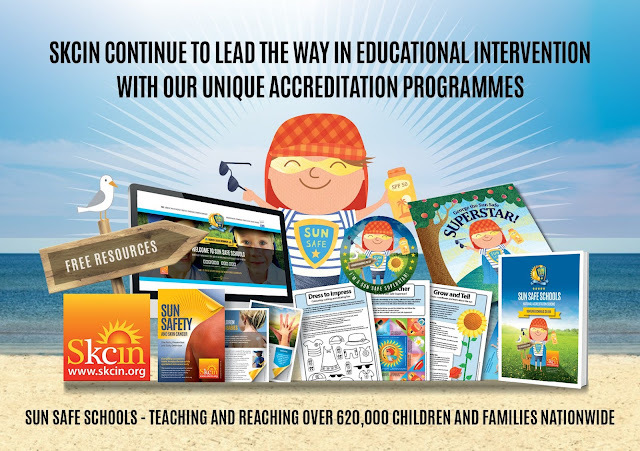 Skcin are pleased to announce that Vale Primary School in Vale, have completed Step 1 towards renewing their Sun Safe Accreditation by reviewing their Sun Safety Policy using our easy, online policy maker. “As last year we continue to encourage legionnaire style sun hats. We have some hats available in school for those children who forget them. We have a not hat play in the sun rule although we try to make sure everyone is wearing a hat. Our staff are encouraged to model sun safety too. As we are in guernsey in addition to the elements of your policy we have an additional section which is about making sure the children have access to water at all times and at all events and facilities to refill their water bottles to make sure that they have plenty to drink. Congratulations to Little Tinkers Childcare & Education for providing shaded areas for their pupils.